Available in Black, Brown or Grey. Comes with 2 single chairs, 1 two seater sofa, cushions to fit and a coffee table. Made from rattan effect PVC so is weatherproof. Plus £19.99 delivery making it £299.98. 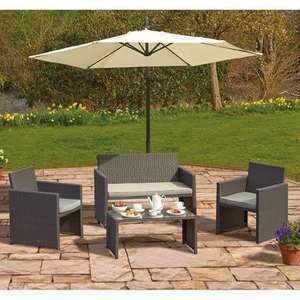 The same set can be had from the telegraph newspaper for £269.98 including delivery. These are everywhere from 199 to 250. B&q, home bargains etc. Where are they £200 ? Deal posting newbie! This is PeterSmith22 first deal post. Help out by leaving a posting tip or just to show your appreciation for their contribution.